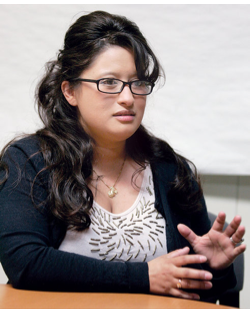 TRACY, CA -- Challenges are nothing new for Xochitl Paderes. The Tracy native had her first child at the age of 15, earned top-secret clearance while in the Marine Corps and has a job streamlining the state’s bureaucracy. Now, she’s taking on Stockton Democrat Susan Eggman for a seat in the state Assembly. Paderes declared earlier this year that she seeks to represent Tracy, Mountain House and the rest of the 13th Assembly District. And the Democrat who’s volunteered with the Stockton Shelter for the Homeless, Tracy Interfaith Ministries and the Guadalupe Center in South Side Tracy says her roots are vital to giving the region the representation it deserves. “(I hear) local leaders growing increasingly concerned about a growing distance between elected leaders and the Central Valley,” Paderes said, adding that while Stockton is the district’s largest city, it’s not the only one that matters. The 36-year-old mother of three who calls Stockton home doesn’t have experience as an elected official. But Paderes says her experience with software and technology for the California Department of Fish and Game gives her insight into state government that few representatives have. Paderes said that while many elected leaders have no idea about the state’s numerous commissions, boards and audit process, she has a firsthand look at the inefficiencies that can hold back government. “(I have) a whole different level of experience … and perspective that a lot of people don’t have,” Paderes said. Her work developing software to streamline the fiscal process for the fish and game department has its roots in her four years of active military service. At the Pentagon, she worked in communications and network engineering, including work on the World Wide Web when it was still in its infancy. But, she said, her motivation for joining the military was her first child — and having someone tell her that she wouldn’t be able to cut it as a Marine. “My decision to join the Marine Corps was because I wanted to be a responsible mother to my son,” she said, adding that her family was hugely supportive. Now, the 36-year-old’s first child is 20 years old, and she is married and has two more children, ages 15 and 10. Policy-wise, Paderes said she recognizes the importance of strong public schools, and that there need to be “strategic and achievable goals” with the state budget. Though she supports a tax increase proposed by Gov. Jerry Brown, she called it a short-term fix to a wide-ranging problem, and suggested that raising taxes alone isn’t going to solve the problem. “We’re putting duct tape on a bucket that’s filled with holes,” she said. Paderes also rejects the idea of building a peripheral canal or tunnel to send water around, not through, the lower reaches of the Sacramento-San Joaquin Delta, an estuary that provides water for part of San Joaquin County’s $1 billion-a-year agriculture industry. As of last week, the California Secretary of State’s website, Paderes, had no campaign contributions to report as of the most recent filing deadline. However, the candidate’s website claims endorsements from the Tracy Police Officers Association, California Nurses’ Association and California Professional Firefighters.